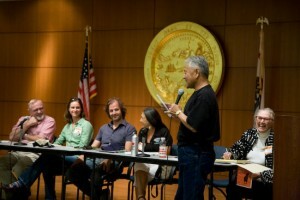 Roots of Change, in collaboration with Slow Food Nation, organized the Changemakers Day in 2008. The goal of this event was to spur deep dialogue, initiate action, expand networks, and inspire lasting change in the sustainable food systems movement. On August 29, 2008, more than 600 people came together for Changemakers Day. As part of the larger Slow Food Nation event, the participants explored the challenges and opportunities we face as we build a movement for a good, clean, and fair food system. The day’s program included over 30 panels, with topics ranging from the future of farming, leadership development, and food system diversity, to forming better links between the health and food movements. Error: Error validating access token: Session has expired on Tuesday, 26-Mar-19 12:54:16 PDT. The current time is Sunday, 21-Apr-19 07:12:53 PDT.